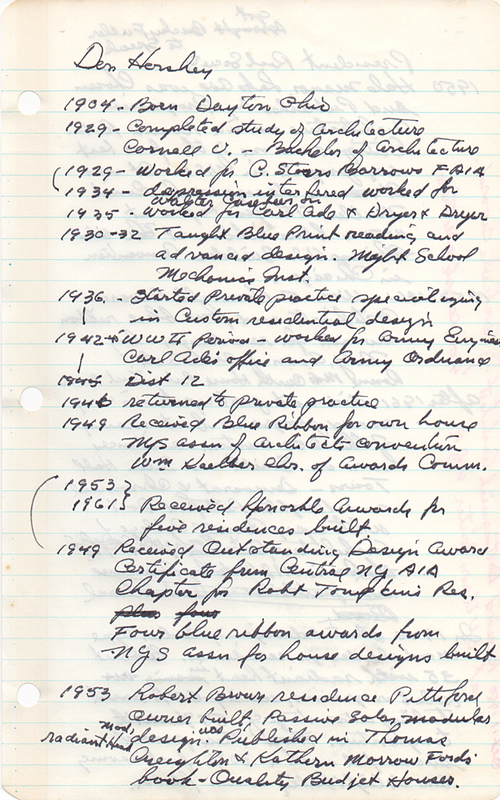 Don Hershey kept a series of notebooks that contain various types of information such as a summary of his career and awards, listings of his various projects, and stories of his early life in Dayton, Ohio where he lived until college. 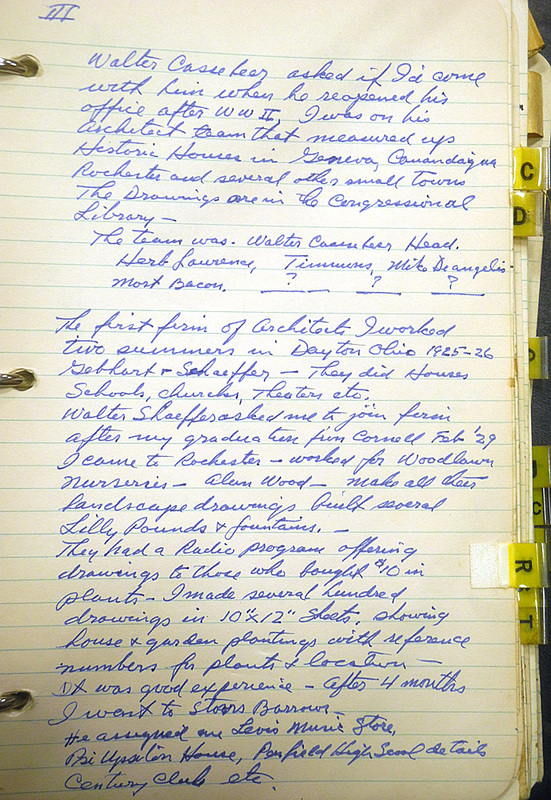 We are gradually transcribing these writings as we go through these books and will be putting the contents up in this section. 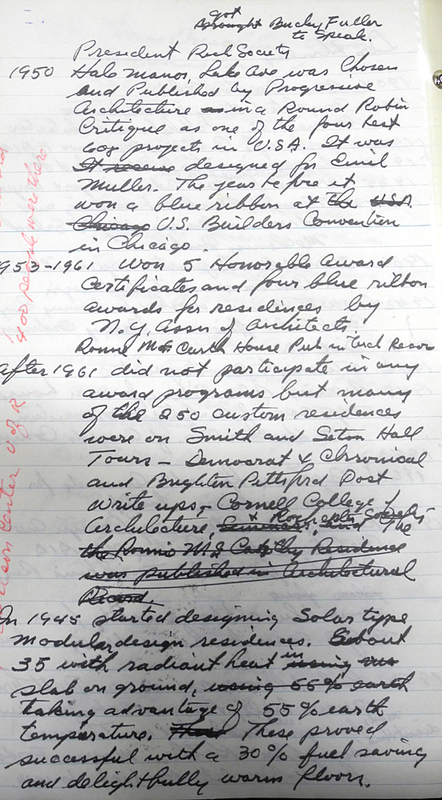 He mentions his incorporation of passive solar design and radiant heat in a slab on the ground of about 35 of his houses in the 1940’s, “taking advantage of 55 degree earth temperature. These proved successful with a 30% fuel saving and delightfully warm floors.” Ideas that were way before their time. It’s also illuminating to hear him describe watching the Wright Brothers (his neighbors in Dayton) do tests with kites while also working on a plane that eventually led to their building the world’s first successful airplane. At this point in my career of 40 years since leaving Cornell School of Architecture we are beginning to be at a crossroads of Tradition versus Modern as we called it then. Now we say Contemporary, a much more sophisticated word. Leaving off the “Con” we have “Temporary.” Did you ever think of it in those terms? We are now a fast moving generation. We cannot sit anymore and enjoy the pure arts. We must move, believing we’re getting behind! I recall as a boy playing behind the Wright Brothers’ store on Third St. in Dayton, Ohio where we lived just a few doors down the street (Williams). 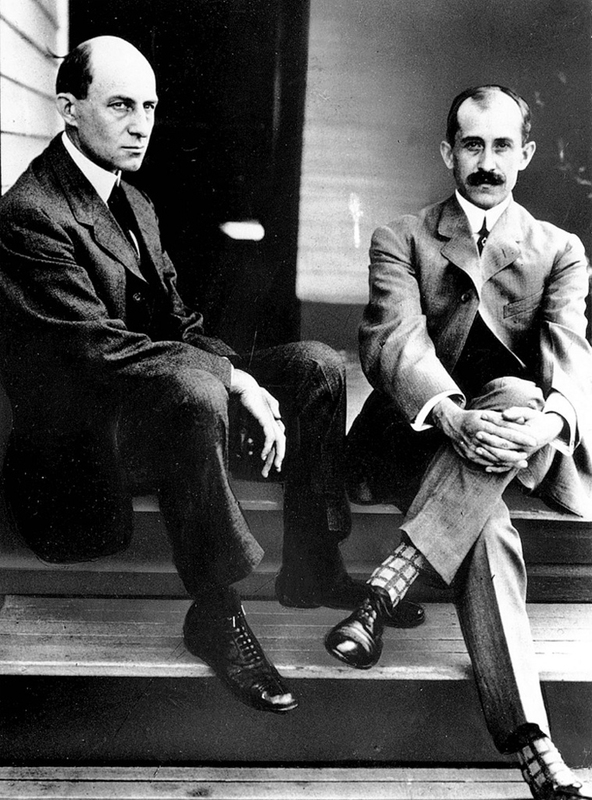 These two gentlemen, Orville and Wilbur, were heroes in our kids’ minds but not so in the older folks’. Generally, they wanted to move forward in getting from one place to another. 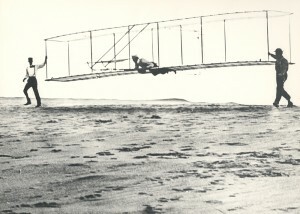 After that first successful flight in 1910 they were invited to receive a special award from the King and Queen in England. By train and boat they received it in 1911 almost a year later. After the arduous journey they felt more than ever that they must do something to help transportation.Their dream was to be able to get from one point to another without interruption – flying over buildings, cities, etc., then drop quietly into their destination. What a wonderful idea and feeling! Today we see this all came to pass but with certain reservations. The planes have gone ? – with extra noise and pollution fumes. Now we are out to fight and correct this fault everywhere. Yet the plane is a blessing in disguise. To be able to communicate in person is worth many letters and phone calls. To extract an understanding correctly more or less, we must meet face to face so as to learn first hand our beefs or objections to our proposals – beliefs or theirs. Possibly now the airplane might be alongside the greatest invention – the wheel – without which neither could exist or proceed progressively. Born Jan 5, 1904 Dayton, Ohio. Graduate Cornell U. Bach of Architecture. 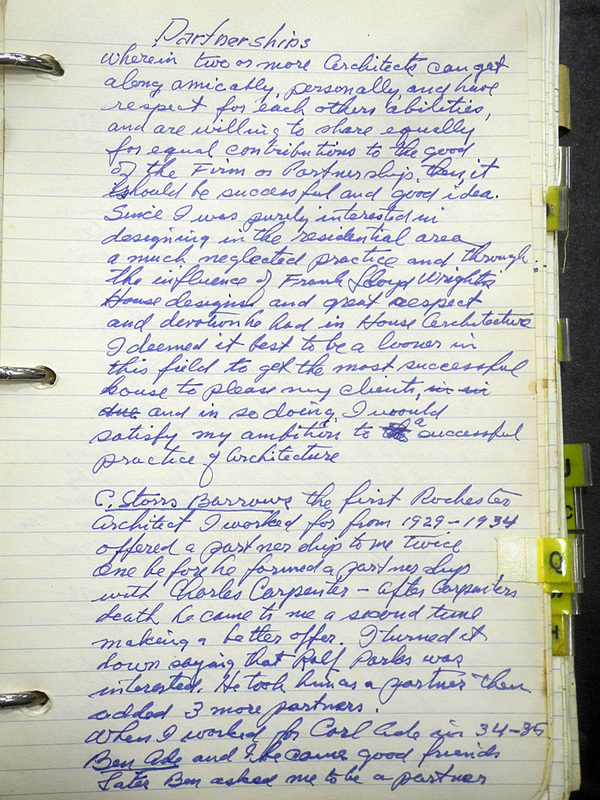 Came to Rochester directly from Cornell in 1929 to work for C. Storrs Barrows until 1934. 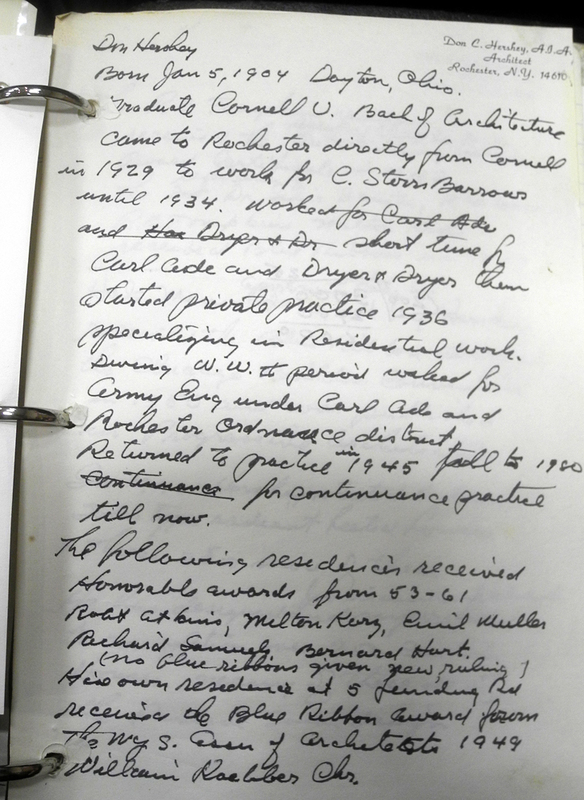 Worked short time for Carl Ade and Dryer & Dryer then started private practice 1936 specializing in residential work. 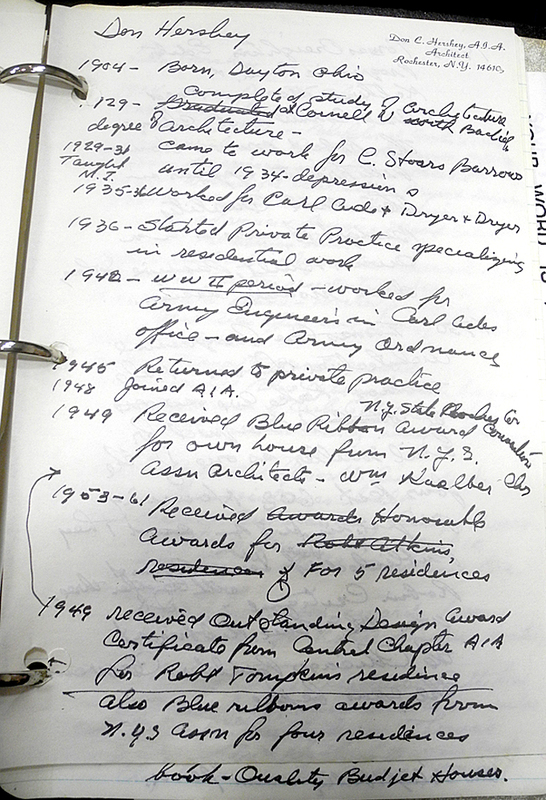 During WWII worked for Army Eng under Carl Ade and Rochester Ordnance district. Returned to practice in 1945 to 1980 for continuous practice till now. The R. E. Tompkins residence received the Central Chapter AIA Outstanding Design Award Certificate in 1949. 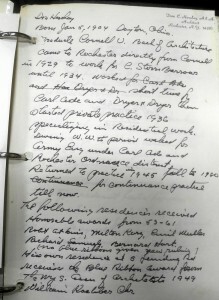 The residences of Dr. Silas Seinta, R McCarthy, R.E. Tompkins, Milton Kroll received Blue Ribbons in 1949. Hale Manor Apartments Lake Ave, designed by Hershey received the Blue Ribbons Award at the Chicago Builders Convention in 1950 and was published in Progressive Architecture. In 1940 Hershey started to design solar type radiant heated houses. There are 35 or more of these. He has designed for individual clients and supervised to completion over 250 custom houses. Many of these are the passive solar design. 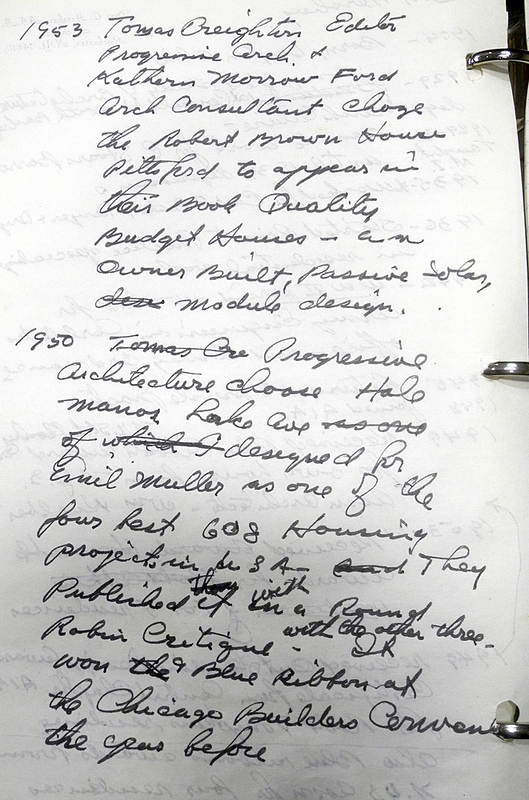 1953 Tomas Creighton, Editor Progressive Arch & Katherin Morris Ford, Arch Consultant chose the Robert Brown House, Pittsford to appear in their book Quality Budget Houses – and Owner Built, Passive Solar, Modular design. 1950 Progressive Architecture choose Hale Manor Lake Ave designed for Emil Muller as one of the four best 608 Housing projects in USA. They published it with a Round Robin Critique with the other three. It won 9 Blue Ribbons at the Chicago Builders Convention the year before. President Roch Society got Bucky Fuller to speak. 1950 Hale Manor, Lake Ave was chosen and published by Progressive Architecture in a Round Robin Critique as one of the four best 608 projects in U.S.A. It was designed for Emil Muller. The year before it won a blue ribbon at U.S. Builders Convention in Chicago. 1953-1961 Won 5 Honorable Award certificates and four blue ribbon awards for residences by N.Y. Association of Architects. Ronne McCarth House published in Architectural Record. In 1945 started designing solar type modular design residences. About 35 with radiant heat in slab on ground, taking advantage of 55% earth temperature. These proved successful with a 30 % fuel saving and delightfully warm floors. These 3 pages discuss Hershey’s experience and feelings about partnerships. We lived at 126 N. Williams St next to the Bakers and across street from Centtrims (sp?) and Dr Marshall (I believe he went with Perry to North Pole). The Bakers were in the Liquor Business and had a store on Third St with big barrels of whiskey which they mixed with according to the customers’ wish. They sold it in their own or your bottle or gallon jug. Across their store was Autruss Ice Cream Co. known as Seus City Ice Cream Co. They used we kids to sample their regular ice cream and different mixes from time to time to see our reaction as to its possible success. We’d sit in their package room in winter then outside in the alley in summer where we held large servings in the tissue cover they used to place over the top of their cans which were delivered to their store customers. The bakers traveled to Panama to see the Canal development at that time 11911 – They built a miniature canal with locks and all in their back yard – then charged 5 cents per boy to see it. My bedroom over looked it where we charged 2 cents per look – when they learned about it they put up a closed fence and shield to cut out good view. 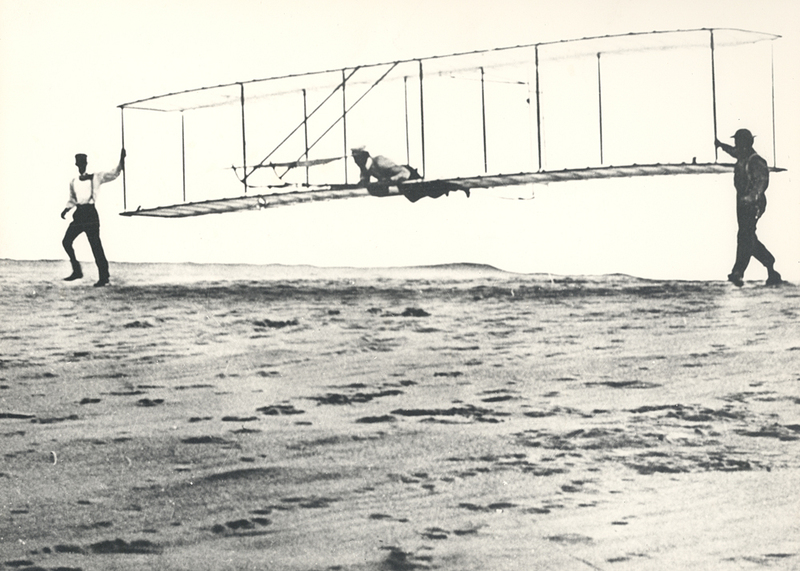 Because of the Wright Bros. This was a very inventive, active neighborhood. There was always something happening which I’ll tell about later. The Wright Bros were very genteel and dressed in good taste. In summer they wore white suits with straw flat hats. In winter Blue serge suits, stiff collars and Derbies (black) with spats on their shoes. One Sunday morning about 1910 – I was 6 years old – and with my brothers Torrance 7 1/2, Lincoln 10, Carl 12, we watched them fly the very large box kite. 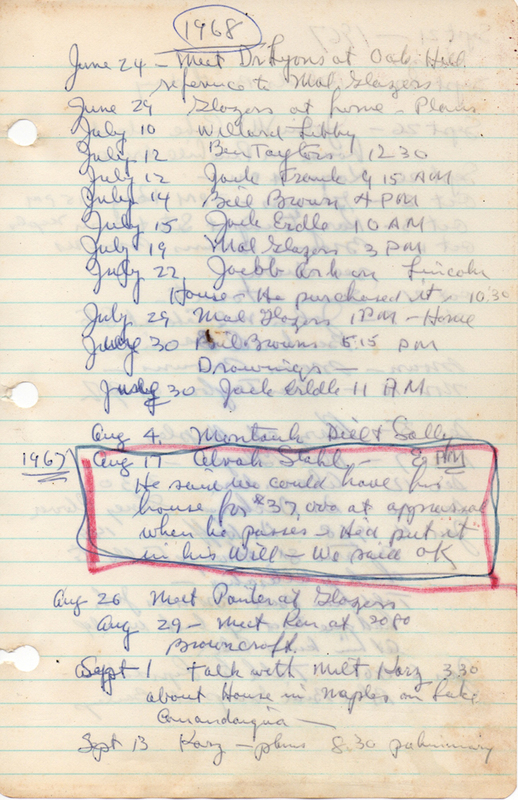 We were allowed to stay near them because my brothers Carl & Linc delivered newspapers to them. They kept the other kids back at Williams St about 30′ away. Then they cranked out the copper wire for about 50′ down the alley (west). Then they lifted the kite up to catch the breeze. It was a good day for flying. The kite lifted fast and the big wood reel spun rapidly. They slowly applied a brake they devised along side of the reel. When the kite was up about 1/2 mile or more they pulled from the back door of the store a silk parachute which they put on the wire carefully with their backs to us. All of a sudden the parachute went rapidly up with a cat which was sitting in a cloth bag with his head out. When the cat got almost to the kite they snapped the wire and the parachute opened and was floating nicely to the north over (the Great Miami) River. Wilbur jumped on his bike and headed up north Williams St, pumping it hard. They had notified the Fire Dept near there that they might have trouble with the cat landing in a tree and would they rescue. Sure enough the fire truck followed him with this long ladder. It landed in a large tree but the firemen fetched it out. All was well. They wanted to learn the reaction on the cat at a distance up they hadn’t reached. It being their store cat it behaved the same so Wilbur came back with cat in one hand as he swung into the alley Orville greeting him saying she looks OK and sounds OK.
Monday morning there was an article by the Assn of Cruelty to Animals criticizing Wrights. They said they would have sent up their pet dog but the cat had 9 lives which they trusted better. We kids got a thrill out of the experiment and would have volunteered if they had asked us. My Grandad Lincoln was partner then later owner of a Dry Goods Store across Third St from their store. He was a good friend of their Mother & Dad and sold merchandise to them. The mother was a fine seamstress. 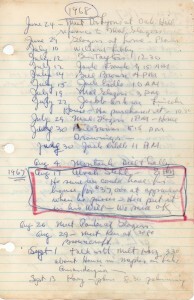 In 1912 we moved to West Levee so was out of touch with the Wright Bros. My brothers still carried papers to them. In late March 1913 we had the Big Dayton Flood. The water rose 131(?) on their store That ended their bike business. They were on their way. It was about 1910 I believe that they returned from England where they flew for King George V. Third St. was decorated up for about 3 or 4 blocks in their store area. The neighborhood gave a big welcome – firecrackers and fireworks at night. Hi, we have a Don Hershey home here in Claremont, CA that we’ve lived in for almost 10 years. We have tried to keep the home as original as possible and the decor to the mid-century modern style. We also have the original blueprints for the home. I can send pictures of the home and driveway stamp if you can provide me with the email address for the website moderator. Nice to read the content on here 🙂 thank you. So exciting to hear from you! I do have indications of Hershey working in Claremont, CA (see http://www.donhershey.com/homes-by-area/other-areas/). On Baughman Avenue, 664 W. 11th Street and 1405 Via Zurita Street. Are you familiar with these homes? Do you know who the original owner of your home was? When was it built? So many questions… And I would love any photos or plans you are able to share. 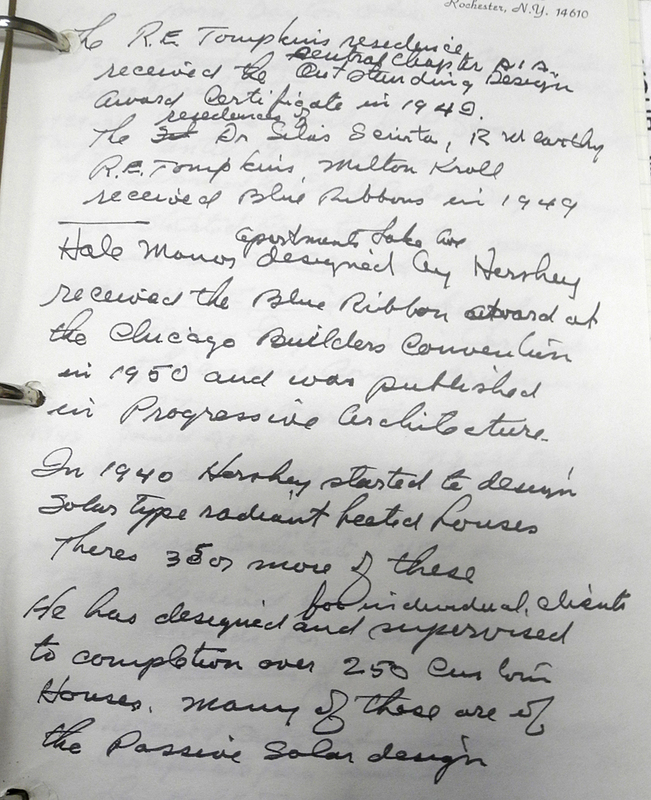 I inquired and heard back from Claremont Heritage who were very helpful and told me there was a builder in Claremont named Don Hershey who built homes for the local architects during the same period that NY architect Don Hershey worked here. I found his obituary online which confirms this. So, mystery solved! I am Karen Hershey Morrell, the youngest of the late Robert (Bob) Hershey’s girls. 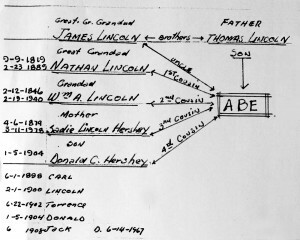 I wasn’t sure you had captured this anywhere on the site but I wanted to be sure you knew that my grandfather was related to Abraham Lincoln. In fact, he was a 4th cousin! We are related down the William Lincoln line who was Abe’s uncle. My grandfather, Don’s mother was named Sadie Lincoln and she married a Hershey. The couple had 5 sons and one of which was my grandfather Don! I love to share that interesting fact with people! So we are related distantly to Milton Hershey but also to Abraham Lincoln! 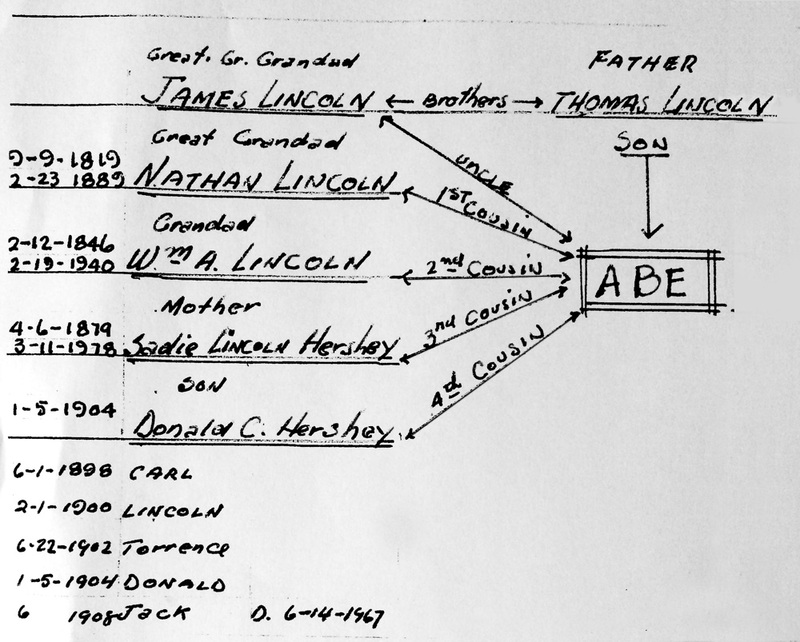 I have a picture that my grandfather drew up that shows the lineage and relationship to Abe. To what email should I send it? It would make a nice addition to the “Notebook” section or “His Life”. Forgive me if I missed it and you already have it! Love this website…..it makes me so very proud! So great to hear from you Karen. 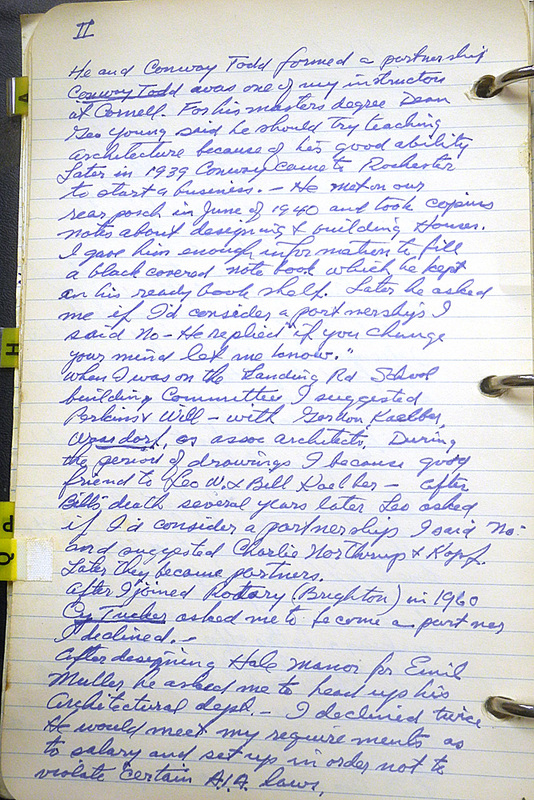 And such an interesting bit of information about your grandfather. I would definitely like to include that picture of the lineage. That probably explains why his brother’s name and his grandfather’s was Lincoln. art work that the Pfluke’s had kept for me after our house was sold in 1978. Our house was designed by Cyril Tucker, and built in 1936 by Emil Muller. Susan,It was on the market when I wrote that post but it sold in Aug 2014. So it appears that that buyer is flipping the house after cutting many trees down (probably to enlarge the buildable section of the lot). From the zillow description it sounds like he hopes to sell to someone who wants to tear it down and build a much larger home. When we went into it during the estate sale of the Gootnicks, it was in disrepair inside. Too bad the new buyer didn’t fix it up and maintain the Hershey structure. How interesting that you grew up next to the Pflukes. And that your house was built by Emil Muller. Hershey designed Muller’s house and worked with him on various projects including the Rotary Handicapped Children’s Camp in Penfield, NY.